The climate in Western Washington is relatively moderate year round, and a large variety of stinging insects make this area their home. Most often, they can co-exist peacefully with humans, and they also provide benefits to your garden. Wasps, Yellow Jackets and Hornets are natural scavengers – their diet consists of flies, caterpillars, and other insects that damage crops and ornamental plants in your yard. They help to clean up decaying organic matter, and most of them act as pollinators, some deliberately, some accidental. The Wasps, Hornets and Yellow Jackets of Western Washington are seasonal only. Even a big nest that’s very active during the Spring, Summer, or early Fall, will eventually become empty and abandoned. Once the days start getting colder in October, all occupants will gradually leave the nest and die off. The nest will not become re-occupied the next year. If you find yourself with a nest on your property, consider letting them stay if they built their nest higher than 20 feet above grade. Even if in a heavily trafficked area, if the nest is higher than 20 feet, chances are they’ll go about their business of pest control without bothering you. If the nest is lower to the ground, or in a cavity, consider letting them stay if it is an area of your yard that you can easily avoid. But if the nest and its occupants become a nuisance that you would like to have removed, give Dan The Bee Man a call! Dan The Bee Man is a Hobby Beekeeper in the Crown Hill Area of Seattle. 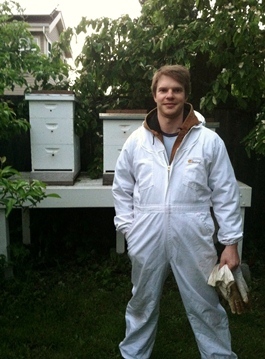 As part of his work with Honey Bees, he is committed to the reduction of the use of pesticides to control insects. After being asked by Friends and Family to remove various stinging insect nests from their properties, the idea for Dan The Bee Man was born. For his own Honey Bee colonies, Dan The Bee Man does not use any bee medications or chemical pest control.